Newmills Parish Church is located in the centre of the village of Newmills, north of Dungannon. 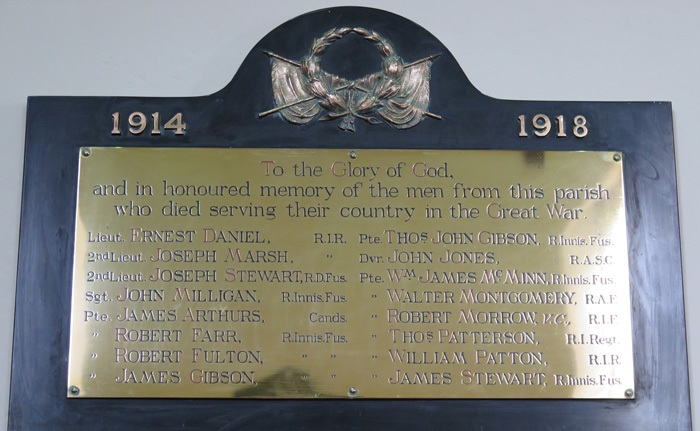 In February 1921 a mural tablet, inscribed with the names of sixteen men from the Parish of Newmills who made the supreme sacrifice in the Great War, was unveiled in the Newmills Parish Church with befitting solemnity by his Grace the Lord Primate on a Sunday afternoon. The crowded congregation included a detachment of the Special Constabulary, under the command of Captain Maynard. The service opened with the singing of "O God our help in ages past," and evening prayer was recited by Rev. Gordon Scott, M.A. the special lesson was read by Rev. H. Egerton, rector of Donaghmore. The tablet, which was draped with the Union Jack, was then unveiled by his Grace, who offered up the dedicatory prayer, after which the National Anthem was heartily rendered. At the conclusion of his address his Grace said the parish of Newmills had achieved a high record in the war, and both men and women had worked with wonderful self-sacrifice to win the victory. To the Glory of God, and in honoured memory of the men from this parish who died serving their country in the Great War.